If you live by the code of ethics prescribed in Wellness 101, you know that lemon water is very much the real deal. While it’s often uttered in the same breath as edible trends like kale, chia seeds and superfruits, lemon water is held to an even higher standard when it comes to efficacy. Once just a simple concoction with a certain spa-level gravitas, lemon water is now recognized as more than just pure refreshment. It turns out the wellness gurus really know their stuff: There are several reasons to make citrus-infused H2O a part of your daily routine. Perhaps most importantly, lemon is an immunity booster. Your immune system protects you from contracting illnesses by combating germs and free radicals. When it’s not working efficiently, your body may develop anything from fatigue to a common cold. Strengthening your immune system can be as easy as upping your intake of vitamin C, a potent antioxidant. One lemon contains almost 31 mg of vitamin C, so adding a squeeze of the stuff to your water is a great way to start the day. It also happens to be a killer digestive aid. While acidic lemon may not be your first choice when your stomach is churning, it actually acts as a smart line of defense against potential tummy upset. Ayurvedic teachings, which focus on holistic forms of healing the mind and body, strongly support drinking a glass of warm water with lemon every morning. This, it’s theorized, stimulates the digestive tract and encourages regularity. Feeling nauseated? It turns out lemon is a great treatment for nausea, whether due to motion sickness, morning sickness or illness. In fact, the National Cancer Institute recommends lemon as a food that is “easy on the stomach.” A glass of tart lemon water may help neutralize a sour stomach and manage the nausea. You know how important it is to drink water, but one key reason many avoid it is because they find it boring. 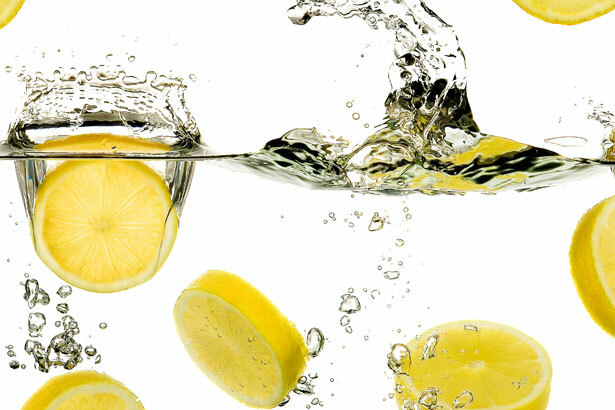 Dressing it up with lemon is an effortless way to revive your interest in water. The body is made up primarily of water, so staying hydrated is essential. And when you really need to be replenished, nothing feels better than a gulp of cool, citrusy water after an intense workout.